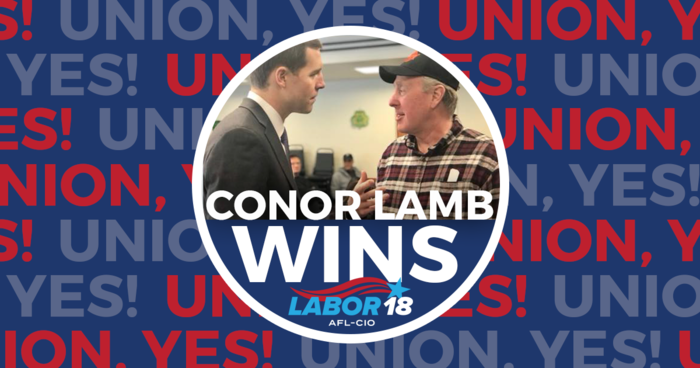 Rep.-elect Conor Lamb made national waves with an improbable win last week in Pennsylvania's 18th Congressional District. He faced down $10 million in outside money funneled to his opponent by corporate and right-wing interests. He fought through a barrage of incessant, hyper-partisan attacks blanketing the airwaves. He was abandoned by his own party's national infrastructure in a district that hadn't elected a Democrat in nearly 15 years. And he still came out on top. It wasn't because of some stale advice whispered into his ear by an overpaid consultant. He doesn't owe this victory to super PACs or corporate donations. It certainly wasn't thanks to the Democratic Party establishment — it's still finding its way out of an agenda and message that failed to resonate with working people in 2016. This election came down to a fight between our grassroots labor coalition and state Rep. Rick Saccone's corporate-funded, RNC-managed smear campaign. The outcome proved what we already knew: The path to power runs through the labor movement.